Montgomery, Alabama has been a flashpoint of Civil Rights activity since the movement’s beginnings in the 1950s. This is the town of Rosa Parks, of MLK, of the Freedom Riders. When the National Memorial for Peace and Justice opened in April 2018, we decided to drive the four hours south from Nashville to see it and some of the other Civil Rights sites there. 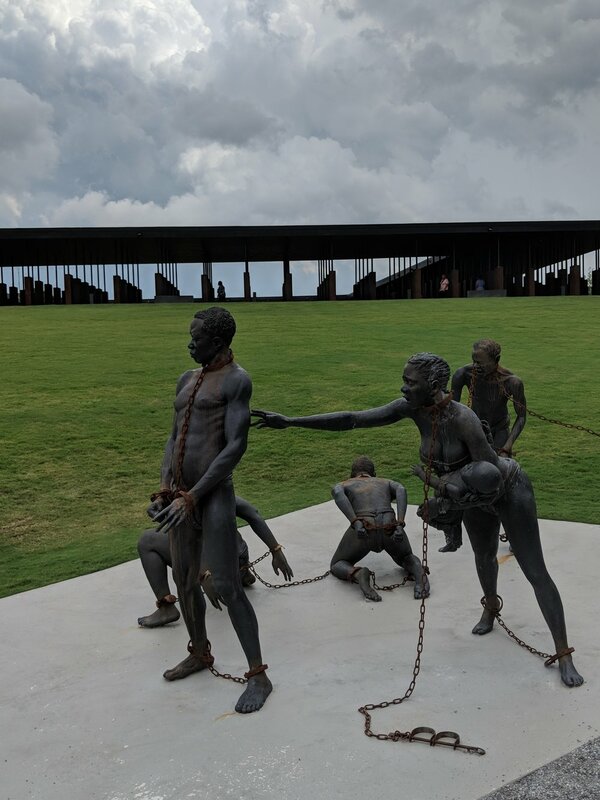 Sometimes called the “Lynching Memorial”, the Peace and Justice site pays tribute to the thousands of blacks who were murdered by white supremacists over the decades. A spiraling walkway leads us past hundreds of huge metal obelisks hanging from the ceiling; each one bears the name of a county, and the names of those who were murdered there. A few counties have just a handful of victims’ names; many have dozens. On the walls are mounted dozens of little signs, each one describing the specific circumstances surrounding a few of the murders. (For instance: A minister was lynched for performing a marriage ceremony for a mixed-race couple; a young man was murdered for registering black voters.) The path gradually descends as it proceeds, until we’re looking up at the hanging objects and they become an all-too-evident representation of the horrifying murders that they memorialize. This is a somber and powerful place to reflect on some of the darkest moments of American history. Several important sites are within a few blocks of one another: The Legacy Museum is set in a downtown building that was once a literal warehouse for slaves. It outlines the grim path that US justice policies have laid out, showing a direct connection from enslavement to Jim Crow laws to mass incarceration. Nearby, the Rosa Parks Museum remembers the famous defiance that prompted the 381-day Montgomery bus boycott. The Dexter Avenue Baptist Church, where Dr. Martin Luther King Jr. preached for six years, was the site of many meetings in planning the boycott, as was the Dexter Parsonage, where the King family lived. This house has been restored to its 1950s condition, including furniture and many personal items used by the family. Also preserved is the damage done when a bomb exploded on the front porch. In the former Greyhound bus station downtown, the Freedom Rides Museum memorializes the bravery and sacrifices of the young men and women who faced violent, racist mobs hell-bent on maintaining segregation in the south. At this and at all the sites we visited, we found the docents to be welcoming and engaging, eager to answer questions and impart their considerable knowledge to curious visitors. When it came to eating in Montgomery, we decided to spend our money in black-owned businesses in town. 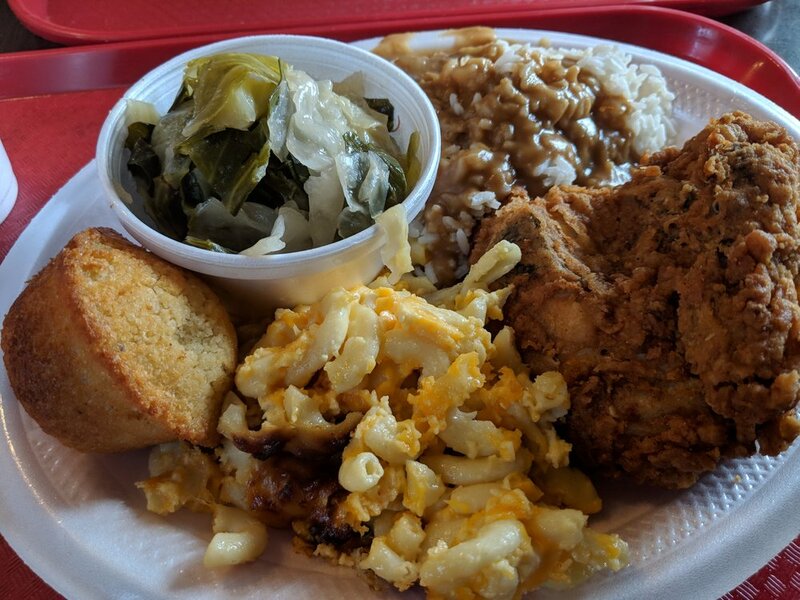 A few blocks west, Margaret Boyd’s Mrs. B’s Home Cooking is a classic southern meat-and-three restaurant, whose sides (like cabbage or collard greens) are cooked with smoked turkey drippings rather than lard. It’s also another “museum”: The walls are plastered with family, military, and celebrity photos, as well as framed press articles of momentous local events. A few blocks southeast of town, Monique Williams’ Cheesecake Empori-yum offers delicious desserts and also, unusually, eggrolls in inventive flavors like “Soulfood” and “Cajun seafood”. 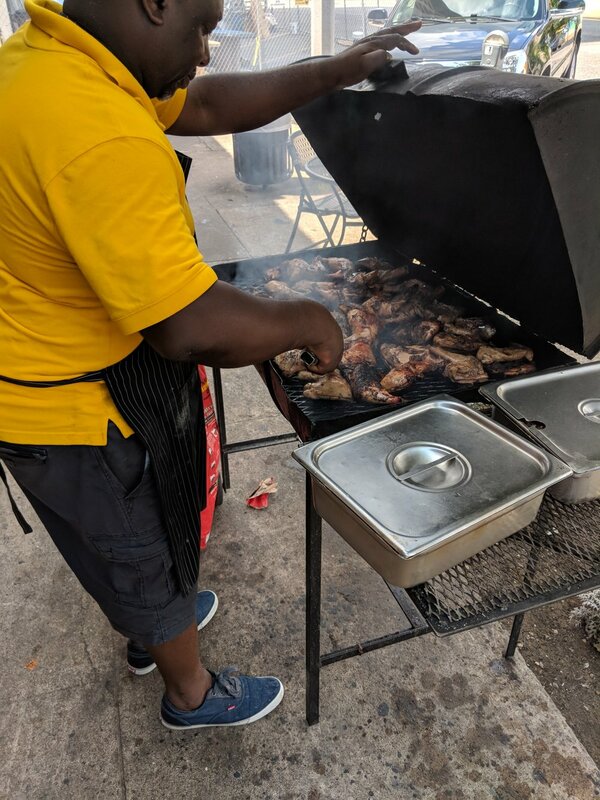 Just around the corner from the Rosa Parks museum is the Savanna Tropical Rotisserie Cafe, where a wood-smoke grill sits out on the sidewalk, enticing customers to partake of authentic Caribbean/African cuisine like savory goat curry or delicious Jamaican jerk chicken. There is more to see in Montgomery than can be covered in a single day. Though we were unable to identify any black-owned hotels, we did find a fantastic Air B&B rental, “The Treehouse at Cottage Hill”. The owner Farris was born and raised in Montgomery; she rents out a full upstairs apartment in her elegant historic (1892) home in a quiet neighborhood, just three blocks away from the Peace and Justice Memorial. Farris is a gracious host, and also a valuable font of information about the history and culture of the city.